Sore neck? Sore back? Too much yard work? Find a bit of relief from your personal Microwave or Freezer pack. Quick and easy to make using fabric from your fabric stash. I have made the long tube and it works great for some areas, but wanted one a bit wider for those aches in the back or legs. All you need is fabric and rice. There are other choices for filling, such as flax, buckwheat, corn, bird seed. You might want to add some essential oils for a pleasant smell or even use dried lavender! Toss into the microwave for moist heat or place in the freezer for cold relief therapy (instead of that bag of frozen veggies). Finished size is 20 x 4 inches. Cut your fabric 21 x 9 inches. Fold over lengthwise. Sew the long side and one short side. Fill with rice (about 2 cups). Sew the last short end. Voila! Ready for relief. Put in the microwave on high for about 2 minutes. The rice retains the heat for quite a bit. Enjoy! Finished size 10 x 12 inches. You can adjust this to the size you wish. Just add one inch to each side for the seams. Cut two pieces 11 x 13 inches. Place right sides together. Sew around all four sides, leaving about 5 inches to turn. Turn. Fill with rice. I used about 6 cups for mine. Adjust the rice according to the firmness you wish. Shift all the rice to one side, fold the raw edges in your opening, and sew shut. I do this with the free-arm. The heavy rice shifts to one side and no fear of it getting under my needle. I made mine from muslin since I want to make a cover. There isn't any method of washing the bag due to the contents, so a cover is nice. If you aren't making a cover then you have finished your pack! 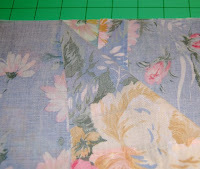 You can make this as fancy as you wish - patchwork, several matching fabrics. For mine, I used part of a vintage pillowcase. Love the colors and the softness of the fabric. Hem one edge of the two shorter pieces. Tip: Lay the pieces right side up. Hem the two farthest edges. This will ensure the hem is correct when sewn together. Lay the large piece right side up. Place one shorter piece on top, wrong side up. The finished hem will be to the left, raw edges will match. Place the second shorter piece on top of both, wrong side up. The finished hem will be to the right, raw edges matching. Sew around all four sides. Cut each corner (for sharper corners). Turn to the right side. Where you placed the hemmed edges is now an open pocket. Nifty huh! Place the Microwave heating/cooling pack inside. The pocket flaps will hold it in very snuggly. When ready to wash the cover, simply remove. Try making one for the eyes. Just follow the eye shape to cut and sew. Fill with flax. Great straight from the freezer for tired eyes.